The incident in question happened on Bus 95 at the end of the school day one day last week. In the video, the WCHS sophomore accuses the middle school girl of saying something to her and then opens a bottle of water and pours it over the 13-year-old’s head. 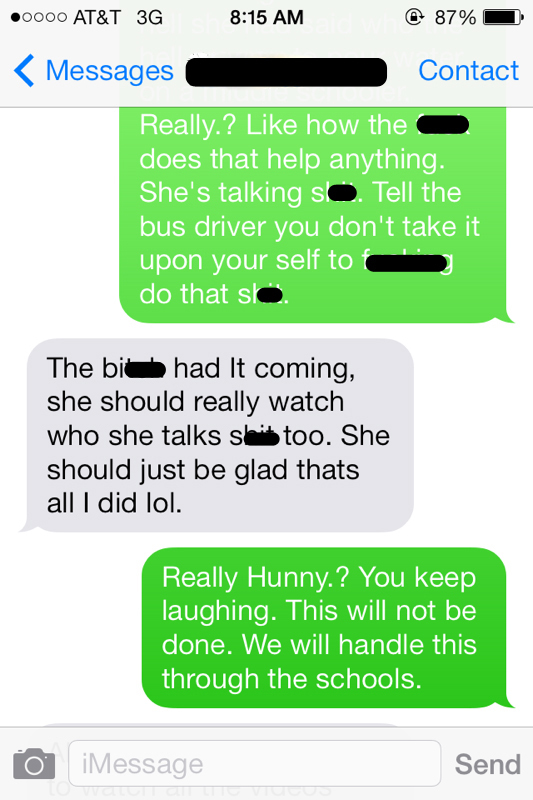 The sister of the victim sent texts to the accused bully. The girl’s response, according to the victim’s mother, is proof the girl is not sorry for actions. The mother of the 13-year-old victim is not only appalled at her daughter’s bully, she is disturbed that the school did not take the act more seriously. She said school personnel were seemingly unconcerned that the attack on her daughter happened and that it appeared to be premeditated. Without ever receiving a return phone call from WCHS School Resource Officer Dave Morales, the mother brought the video of her daughter being bullied to StaceyPageOnline.com asking that other parents begin to ask questions of what happens on their own children’s buses. Warsaw Community High School Principal Troy Akers told us the sophomore girl has been disciplined, which did include a bus suspension, but due to school policies he cannot reveal what the exact consequences were. The middle schooler’s mother, however, said the accused bully was suspended from school for the rest of this week and will be able to return to classes Monday, a punishment she said does not follow the corporation’s policy. Per the WCS guidelines, acts of fighting, intimidation and threats made to students and/or staff constitutes 10 days of out of school suspension, police must be notified and a request for expulsion is filed. The victim’s mother says the discipline did not follow protocol and she is also concerned because the two other girls who videoed the incident were not punished. The alleged bully also seemingly violated two rules in the student discipline policies. 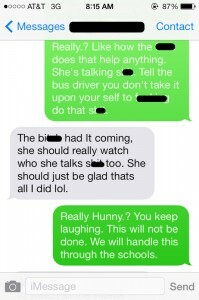 The first is that she clearly “committed an act of defiance against (a) staff member,” in this case the bus driver, and “failed to observe the reasonable and specific written or verbal direction of school authorities.” The girl adamantly disobeys the bus driver who repeatedly told her to apologize to the victim. The incident on Bus 95 happened over the middle school girl’s alleged name-calling of the high school student that had gone on for some time. Akers noted that, if that is the case, that also constitutes as bullying and would be addressed. Akers insisted the entire administration and staff of WCS do take bullying seriously and, because this particular incident does qualify as bullying, a complete report will be filed and further investigation will take place.